Are you more worried about the web traffic that your site receives or about the leads it generates? The way you answer to this question can reveal a lot about you as a marketer. Although there are plenty of techniques to increase conversion, it’s always crucial to have a clear vision of the quality and amount of lead generation you are able to create with respect to the number of visitors on your site. Do you have tons of visitors but few of them become paying customers? Do you struggle to build loyalty with your customers? You have a problem. To start boosting your lead generation numbers, one of the most significant metrics to track is the Conversion Rate. The Conversion Rate is the percentage of visitors who convert and become active leads. There are hundreds of methods to increase users conversion rates, but today I’d like to talk about a newly emerging strategy. This strategy that allows you to understand how to interact with your users and know right off the bat their opinion about you and your service. 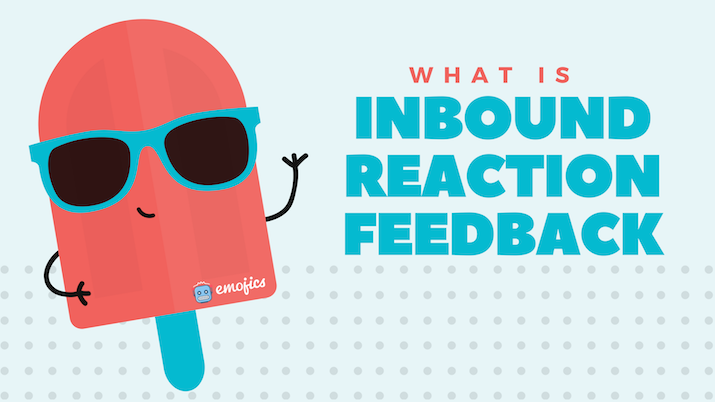 The Inbound Reaction Feedback is a strategy that aims at increasing conversion rates and attracts the interest of users by letting them share their feelings via emojis. Thanks to this strategy you can build targeted future interactions based on the feedback users leave. 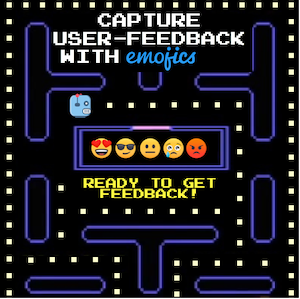 Among the tools that make this strategy possible there’s Emojics, which helps you gather feedback and leads by allowing users to share their sentiments with regards to your content or service. So what do we mean by Inbound Reaction Feedback? Let’s take a look at the four steps we need to follow to implement this strategy. Your first step will be to lead your customers to take some type of action and provide feedback about your or your product. Here is where emojis come into the screener picture. The use of emojis is on an all-time high because they have proven to be a highly engaging tool with which to gather input from users. This is backed up by a very interesting six-month study done by Quintly on Instagram, between January and July 2017. The study found that simply by using emojis, a post could achieve a 15% higher rate of engagement. The potential results gathered by employing such minimal efforts speak volume about the effectiveness of the Inbound Reaction Feedback strategy. 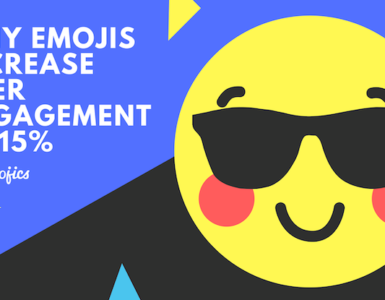 To learn more on how emojis increase user engagement according to science and psychology , you can read this interesting article on Why Emojis increase User Engagement by 15%. What makes this tool so handy and accessible is the overwhelmingly high number of emojis that have been created to represent every kind of emotion you might want to tap into. This is a growing business with lots of potential. I mean, it’s enough to know that someone out there even created emojis for Frida Calo and Van Gogh! This means that you can request feedback from your users through the emojis that most reflect your blog, service or product, thus personalizing your brand to the fullest! Whether you are a pilot, doctor or a chef, there will surely be an emoji that represents you or your product/service. This type of strategy is not something that only small businesses dabble into. Huge brands have successfully leveraged the power of emojis as their marketing strategy: McDonald’s ran a winning advertising campaign using emojis which went viral. 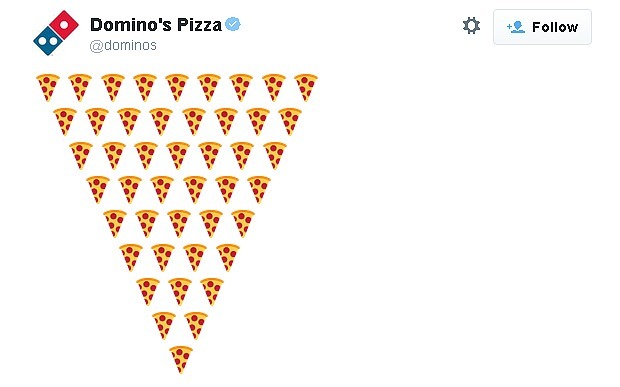 Domino’s Pizza did the same on Instagram. Even Disney integrated emojis in their outreach strategy producing a video in which they retold the story of Beauty and the Beast using only emojis! Now that you have got your users hooked by using emojis, it’s time to seize the opportunity and interact with them, taking advantage of what is known as inbound strategy. Inbound marketing is a strategy in which promotions are activated to users who have already expressed their interest, and therefore it is a matter of establishing a conversation with someone that already fits into your Buyer Persona profile. The tools most often used by blogs for lead conversion make use of outbound marketing tools called “interruption marketing” because, unlike inbound tactics, these methods interrupt the attention of users and often divert it away from their interests. The thousands of promotions and offers that are shoved into our feeds or clutter our site surfing experience on a daily basis have taught us to avoid outbound marketing messages with great agility. 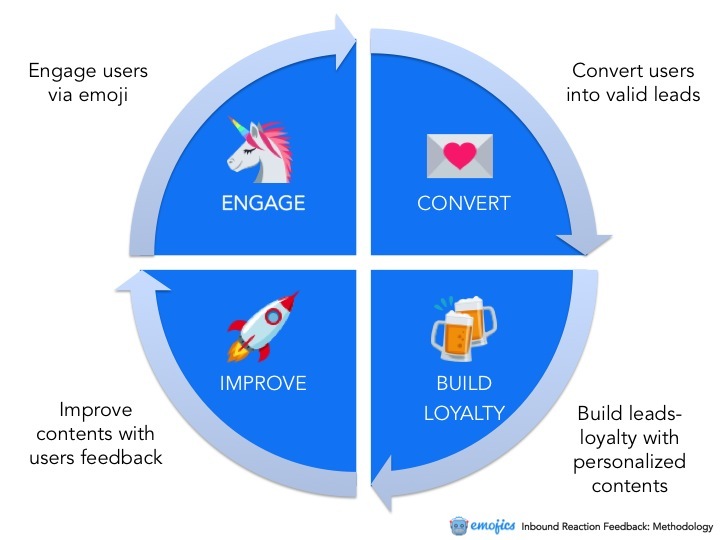 The Inbound Reaction Feedback strategy allows you to follow up and interact with your users in a more meaningful way once they express their feedback by clicking on an emoji. One of the things that stands out about this method, and differentiates it from the classic inbound marketing, is the exactly this ability to appropriately customize interactions according to the sentiments expressed by the user. For example, if your user is happy or entertained by content, you can ask her to subscribe to your newsletter, while if she is angry you can ask her to leave a comment or offer her a coupon code as a first step to build trust and loyalty. In this way, not only you manage to use a non-intrusive tactic which does not interrupt your visitor from reading the article, but you can also increase your conversion rate. The type of feedback your visitors leave, will give you a heads up about who are the users that are actively interested in your service. This will allow you to direct your precious time and resources towards them. Thanks to this strategy, you can ask users that left positive emojis to share their contacts and ask those who did not like your content or had a dissatisfying user experience, for useful feedback. With this practical strategy, you will be able to not only increase the percentage of converting visitors but, just as importantly, get valid leads from people that are genuinely interested in your work. The results and quality of engagement you will receive from implementing this strategy will mark a stark difference from what you might get when instead users are forced to share their email, which often result in them grudgingly give you a fake address just to get past the hundredth popup of the day! To sum things up, once we attract and convert users into valid leads, we just have to keep them engaged and turn them into active leads. 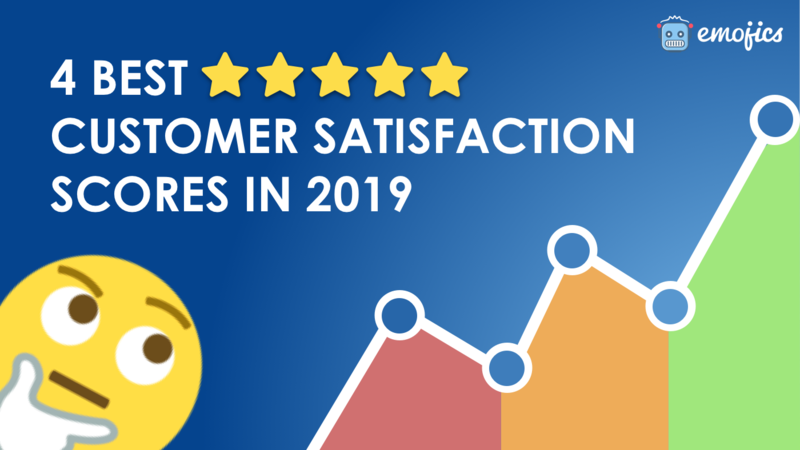 If we use the data appropriately, we’ll be able to make our clients so pleased with our services that they will become loyal customers and even happily promote our products to their friends and colleagues! Nowadays, users almost expect us to be able to read their minds and send them content that is always relevant and interest them in our newsletters. Despite the possible ninja skills one might have developed, we’re still probably lacking in the supernatural powers department, so what can help us getting a glimpse of the interests of your readers will be the feedback that they leave. With this type of feedback, you’ll be able to lay out a complete map of the preferences of your users, detailing what topics they want to read about and what areas interest them less. This type of data will allow you to build detailed segments of users based on the reactions that have left. Now you’ll simply need to step up your game and integrate the knowledge you have with some type of marketing automation tools (such as MailChimp, for example) to send newsletters with content that is so customized and personalized that it will let you build loyalty with your users at a faster pace. This is a killer strategy that will let you identify your targets in a clear, error-free and no-nonsense manner. The Inbound Reaction Feedback will make it so that users will never receive what they did not like and this will reduce the risk of them unsubscribing from your newsletters. Thanks to this new strategy, only what interests them makes its way to their inbox! The last step you need to follow is to effectively leverage all the data collected through the reactions feedback of your users in order to improve your content. To date, analyzing the data of your articles in a quantitative manner is an action of absolute importance so that you can gauge the general (or specific!) direction of topics that your users are most eager to read about. Once you acknowledge your users’ preferences, you can adjust your content strategy accordingly. To do this, you need to connect different metrics to each other so as to get an overview of how well your article is performing or how engaging a topic is with respect to other content you have published. Using your users’ feedback data on your site to understand which content engages them is a simple and winning strategy to improve the effectiveness of your articles. Therefore, not only users can leave feedback through a single click, but the results you receive will always be easy and intuitive to interpret! By analyzing the reactions users leave, you can perfectly understand the performance of your content. These reactions will further provide you with a clear vision of who your users are, where they come from and what their preferences are. Based on these important clues, you can keep improving your content in the direction indicated by your users, and this will be a fundamental key to increasing conversion rates. I don’t need to tell you that the real secret to increasing conversions lays in doing or writing about something you are actually passionate about. If this is something you are already doing, then allowing your users to easily share their emotions about your work with a simple click, can help you grow exponentially. The Inbound Reaction Feedback strategy will help you clearly understand what users think of your content. In turn, this will let you interact with them better since you have the right resources to know how they feel, first hand. As we have seen in this post, emojis are revolutionizing our online interactions. Leveraging this wave of innovation through the new strategy we mentioned could prove to be a great way to increase conversions, improve the readability of your posts, connect and build trust with your visitors.